The Horten Ho 229 V3 from the aft. This overall view of the Horten Ho 229 V3 highlights the heavily rusted intake fairing on the left. The tail of the Horten Ho 229 V3 shows the presence of a green paint on the exterior of the aircraft. Center section of the Horten Ho 229. 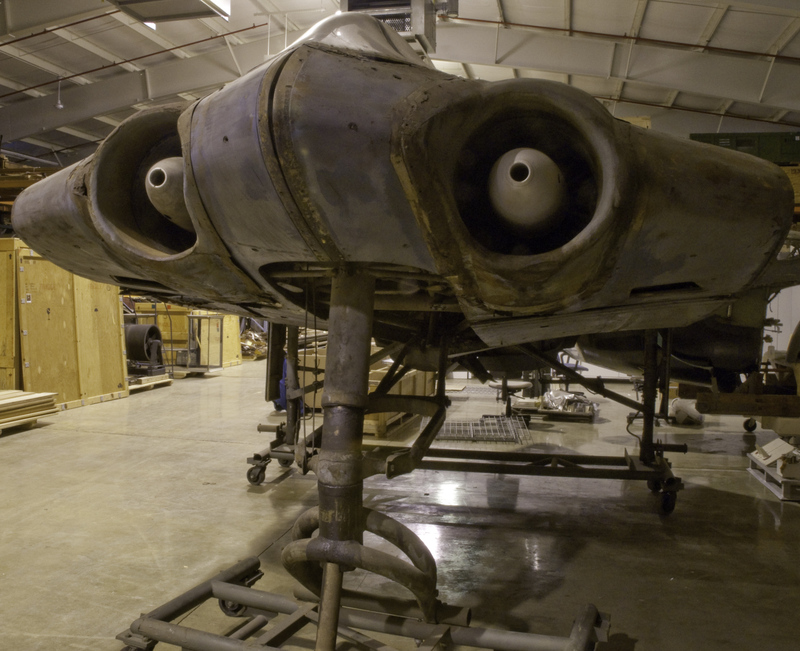 Center section of the Horten H IX V3 at the Paul E. Garber Preservation, Restoration and Storage Facility in Suitland, Maryland. Close up of the acrylic canopy being analyzed by our conservation staff and Smithsonian's Museum Conservation Institute (MCI). Museum staff fabricated a steel stand to support and protect the center-section of the aircraft during transit. 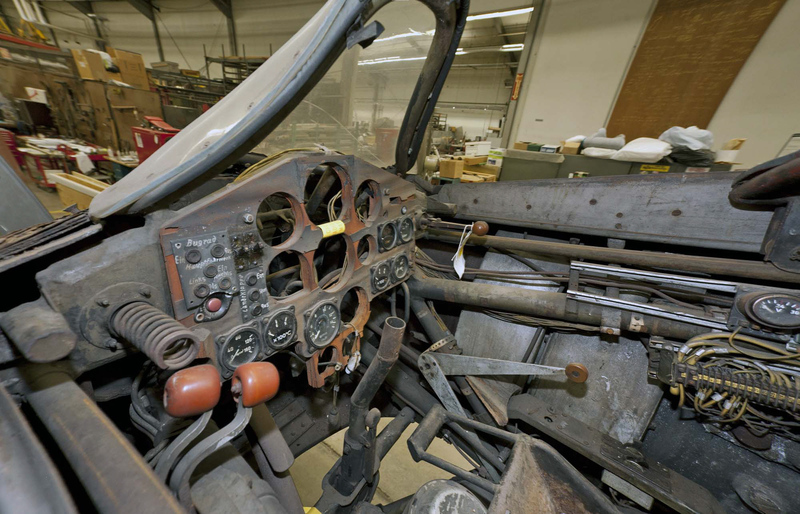 Museum conservators treat various parts of the Horten Ho 229 V3. The center section of the Horten Ho 229 V3 is prepared for preservation work at the Mary Baker Engen Restoration Hangar. The Horten Ho 229 V3 aircraft is prepared for transport from the Paul E. Garber Facility to the Mary Baker Engen Restoration Hangar at the Museum in Virginia. Left 1/4 front view of unassembled Horten Ho 229 V3. Aircraft mechanic Karl Heinzel stabilizes hardware on the leading edges of the Horten Ho 229 V3. Wings of the Horten H IX V3 at the Paul E. Garber Preservation, Restoration and Storage Facility in Suitland, Maryland. Artisans have built airplanes with plywood since well before World War I because crossing each layer, or ply, counters the weakness of a single sheet when bent with the grain rather than across the grain (Melvin Wachowiak /Smithsonian MCI photo). A robust network of welded steel tubing frames the right outer edge of the Horten H IX V3 center section. Behind the tubing lies a maze of plumbing for one of the Jumo 004 jet engines, the fuel system, and other equipment (Melvin Wachowiak /Smithsonian MCI photo). German artisans formed the wood around the nose of the Horten H IX center section using steam to make it soft and pliable, and then bending it to shape. This photograph by Kenneth S. Kik shows the outer wing panels attached to the center section of the Horten Ho 229 V3. Photo taken 1950. In 1943 the all-wing and jet-propelled Horten Ho 229 ('aitch-oh-two-two-nine') promised spectacular performance and the German air force (Luftwaffe) chief, Hermann Göring, allocated half-a-million Reich Marks to the brothers Reimar and Walter Horten to build and fly several prototypes. Numerous technical problems beset this unique design and the only powered example crashed after several test flights but the airplane remains one of the most unusual combat aircraft tested during World War II. In 1943, the chief of the German Luftwaffe (Air Force), Hermann Göring, allocated half-a-million Reich Marks to the brothers Reimar and Walter Horten to build and fly several prototypes of the all-wing and jet-propelled Horten Ho 229 ('aitch-oh-two-two-nine'). Numerous technical problems beset the project and the only wing to fly with jet power crashed during its third test flight; nonetheless, the airplane remains one of the most unusual combat aircraft tested during World War II. The idea for the Horten H IX, as designer Reimar Horten called it, grew first in the mind of Walter Horten when he was serving in the Luftwaffe as a fighter pilot in 1940 during the Battle of Britain. Horten was the technical officer for JG (Jadgeschwader or fighter squadron) 26 stationed in France. The nature of the battle and the tactics employed by the Germans spotlighted the design deficiencies of the propeller-driven Messerschmitt Bf 109, Germany's most advanced fighter airplane in service at that time. Pilots had to fly across the English Channel or the North Sea to fulfill their missions, primarily escorting German bombers and attacking British fighters, and Walter Horten watched his unit lose many men over hostile territory at the very limit of the Bf 109's range. Often after just a few minutes in combat, the Germans frequently had to turn back to their bases or run out of fuel, and this lack of endurance severely limited their effectiveness. The Messerschmitt was also vulnerable because a single, liquid-cooled engine propelled it. One bullet could puncture almost any part of the cooling system, causing the engine to overheat and fail in just a few minutes. Walter Horten came to believe that the Luftwaffe needed a new fighter designed with performance superior to the Supermarine Spitfire, Britain's most advanced fighter. The new airplane required sufficient range to fly to England, the capability to loiter for a useful length of time and engage in combat, and then to return safely to base. He believed that a twin-engine aircraft enhanced all of these attributes. Reimar had experimented with piloted all-wing aircraft since 1933, using his skills as designer and aerodynamicist to overcome several of the limitations that had always plagued the all-wing configuration. The new fighter needed a powerful, robust propulsion system to give the airplane the highest speed, but also to absorb damage and continue to function. The Nazis were already developing the jet turbine power plant in great secrecy, but Walter's role as JG 26 technical officer gave him access to information about the work. Walter knew that jet propulsion would appeal to Reimar because he could add it to all-wing configuration more easily, and achieve far greater performance by doing so, than was possible with reciprocating engines. Reimar began to think seriously about the jet wing at the end of 1940. Fiercely independent and lacking the proper intellectual credentials, Reimar worked outside the mainstream German aeronautical community whenever he could. The authorities denied him access to wind tunnels to test his ideas, in part because of Reimar's youth and lack of advanced education, so he developed his designs using flying models and piloted aircraft. He had already successfully flown more than 20 aircraft by 1941 but a jet-propelled wing would be heavier and faster than any previous wing. To minimize the risk of experimenting with such an advanced aircraft, Reimar built and tested several interim designs, each one moderately faster, heavier, or more advanced in some significant way than the one before it. Reimar built the Horten H V b and H V c to evaluate the all-wing layout when powered by twin engines driving pusher propellers. He began in 1941 to consider fitting the Dietrich-Argus pulse jet motor to the H V but this engine had drawbacks and in the first month of 1942, Walter gave his brother dimensioned drawings and graphs that charted the performance curves of the new Junkers 004 jet turbine engine (this engine is also fitted to the following NASM aircraft: Messerschmitt Me 262, Arado Ar 234, and Heinkel He 162). Later that year, Reimar flew the H VII, which was similar to the H V but larger and equipped with more powerful reciprocating engines. The H VI sailplane also figured into the preliminary aerodynamic design of the jet wing after Reimar tested the sailplane with a special center section. Walter Horten used his personal connections with important officials to keep the idea of the jet wing alive in the early stages of its development. At the beginning of 1943, Walter heard Göring complain that Germany was fielding 17 different types of twin-engine military airplanes with similar, often mediocre, performance, but spare parts were not interchangeable between any two of these designs. He decreed that henceforth he would not approve for production another new twin-engine airplane unless it could carry 1,000 kg (2,210 lb) of bombs to a 'penetration depth' of 1,000 km (620 miles, penetration depth defined as 1/3 the range) at a speed of 1,000 km/h (620 mph). Asked to comment, Reimar announced that only a warplane equipped with jet engines had a chance to meet those requirements. In August Reimar submitted a short proposal for an all-wing aircraft that came close to achieving Göring's specifications, who then issued the brothers a contract, and demanded the new aircraft fly in 3 months! Reimar responded that the first Horten IX prototype could fly in six months and Göring accepted this schedule after revealing his desperation to get the new fighter in the air with all possible speed. Reimar designated each of his major wing designs with Roman numerals. When the H IX became an official Luftwaffe experimental project, it became known as the Ho 229 and each prototype received a Versuch (test or experiment) sub-designation, abbreviated V, and followed by a number, as in Ho 229 V1 for the first prototype Horten jet wing. The third prototype was designated the Ho 229 V3. In September 1944, Göring selected Gotha to mass-produce the Horten jets. All versions of the Ho 229 resembled each other in overall layout. Reimar swept each half of the wing 32 degrees in an unbroken line from the nose to the start of each wingtip where he turned the leading edge to meet the wing trailing edge in a graceful and gradually tightening curve. There was no fuselage, no vertical or horizontal tail, and with landing gear stowed (the main landing gear was fixed but the nose wheel retracted on the first prototype Ho 229 V1), the upper and lower surface of the wing stretched smooth from wingtip to wingtip, unbroken by any control surface or other protuberance. Horten mounted elevons (control surfaces that combined the actions of elevators and ailerons) to the trailing edge and spoilers at the wingtips for controlling pitch and roll, and he installed drag rudders next to the spoilers to help control the wing about the yaw axis. He also mounted flaps and a speed brake to help slow the wing. When not in use, all control surfaces either lay concealed inside the wing or trailed from its aft edge. Parasite or form drag was virtually nonexistent. The only drag this aircraft produced was the inevitable by-product of the wing's lift. Few aircraft before or after the Ho 229 have matched the purity and simplicity of its aerodynamic form but whether this achievement would have led to a successful and practical combat aircraft remains an open question. Building on knowledge gained by flying the Horten H V and H 'VII, Reimar designed and built the piloted glider version, the Ho 229 V1, which test pilot Heinz Schiedhauer first flew 28 February 1944. This aircraft suffered several minor accidents but a number of pilots flew the wing during the following months of testing at Oranienburg and most commented favorably on its performance and handling qualities. Reimar used the experience gained with this glider to design and build the jet-propelled Ho 229 V2. Wood is an unorthodox material from which to construct a jet aircraft and the Horten brothers probably preferred to use aluminum but Reimar certainly was capable of designing the outer wing panels to be built with wood and the center section with welded steel tubes, having designed and built nearly all of his wings this way. Reimar's calculations showed that he would need to convert much of the wing's interior volume into space for fuel if he hoped to come close to meeting Göring's requirement for a penetration depth of 1,000 km (620 miles). Perhaps Reimar lacked either the expertise or the special sealants to manufacture such a 'wet' wing from metal. Whatever the reason, he believed that an aluminum wing was unsuitable. As they developed the Ho 229, the Horten brothers measured the wing's performance against the Messerschmitt Me 262 jet fighter. According to Reimar and Walter, the Me 262 had a much higher wing loading than the H IX and it required such a long runway to take off that only a few airfields in Germany could accommodate it. The Ho 229 wing loading was considerably lower and this allowed it to operate from airfields with shorter runways. Reimar also believed, perhaps naively, that his wing could take off and land from a runway surfaced with grass but the Me 262 could not. If this had been true, a pilot flying the Ho 229 would have had many more airfields from which to fly than his counterpart in the Messerschmitt jet. Successful test flights in the Ho 229 V1 led to construction of the first powered wing, the Ho 229 V2, but poor communication with the engine manufacturers led to lengthy delays in finishing this aircraft. Horten first selected the 003 jet engine manufactured by BMW but then switched to the Junkers 004 power plants. Reimar built much of the wing center section based on the engine specifications sent by Junkers but when two motors finally arrived and Reimar's team tried to install them, they found the power plants were too large in diameter to fit the space built for them. Months passed while Horten redesigned the wing and the jet finally flew in mid-December 1944. Full of fuel and ready to fly, the Horten Ho 229 V2 weighed about nine tons and thus it resembled a medium-sized, multi-engine bomber such as the Heinkel He 111. The Horten brothers believed that a military pilot with experience flying heavy multi-engine aircraft was required to fly the jet wing and Scheidhauer lacked these skills so Walter brought in veteran Luftwaffe pilot Lt. Erwin Ziller. Sources differ between two and four on the number of flights that Ziller logged but during his final test flight, an engine failed and the Ho 229 V2 crashed, killing Ziller. According to an eyewitness, Ziller made three passes at an altitude of about 2,000 m (6,560 ft) so that a team from the Rechlin test center could measure his speed from the ground using a special instrument called a theodolite. Ziller then approached the airfield to land, lowered his landing grear at about 1,500 m (4,920 ft), and began to fly a wide descending spiral before crashing just beyond the airfield boundary. It was clear to those who examined the wreckage that one engine had failed but the eyewitness saw no control movements or attempt to line up with the runway and he suspected that something had incapacitated Ziller, perhaps fumes from the operating engine. Walter was convinced that the engine failure did not result in uncontrollable yaw and argued that Ziller could have shut down the functioning engine and glided to a survivable crash landing, perhaps even reached the runway and landed without damage. Walter also believed that someone might have sabotaged the airplane but whatever the cause, Walter remembered "it was an awful event. All our work was over at this moment." Ziller's test flights seemed to indicate the potential for great speed, perhaps a maximum of 977 km/h (606 mph). Although never confirmed, such performance would have helped to answer the Luftwaffe technical experts who criticized the all-wing configuration. At the time of Ziller's crash, the RLM had scheduled series production of 15-20 machines at Gotha. Horten had planned to arm the third prototype with cannons but the war ended before this airplane was finished. Unbeknownst to him or Walter, Gotha designers substantially altered the V3 airframe as they attempted to finish it. For example, they used a massive nose wheel compared to the unit fitted to the V2, and Reimar speculated that the 1,000 kg (2,200 lb) design bomb load may have influenced them, but he believed these alterations unnecessary. The U. S. VIII Army of General Patton's Third Army found the Ho 229 prototypes V3 through V6 at Friedrichsroda, Germany, in April 1945. Horten had designed airframes V4 and V5 as single-seat night fighters and V6 would have become a two-seat night fighter trainer. The V3 was approximately half finished and nearest to completion of the four airframes. Army personnel removed it three days later and shipped it to the U.S., and the incomplete center section arrived at Silver Hill (now the Paul E. Garber Facility, Suitland, MD) in 1952. There is no evidence that any wing sections were recovered at Friedrichsroda, however members of the 9th Air Force Air Disarmament Division found a pair 121 km (75 miles) from this village, and these wings might be the same pair now included with the Ho 229 V3. In 1983, Reimar wrote in Nurflugel: Die Geschichte der Horten-Flugzeuge 1933-1960 (Herbert Weishaupt, 1983) that he had planned to sandwich a mixture of sawdust, charcoal, and glue between the layers of wood that formed large areas of the exterior surface of the Ho 229 jet wing to shield, he said, the "whole airplane" from radar, because ""the charcoal should absorb the electrical waves. Under this shield, then also the tubular steel [airframe] and the engines [would be] "invisible" [to radar]"” (p. 136, author translation). Reimar was describing a process for reducing the radar energy reflected from the wing, lowering its radar cross-section, or RCS, so that the jet wing would be more difficult to detect by an adversary using radar, and therefore able to carry out its mission with greater stealth. When interviewed in the mid-1980s, Reimar further claimed that he had specifically used wood to build a substantial portion of the Ho 229 because the material did not reflect radar energy. Asked to explain the background to these actions, the designer replied that "we made it of our own inspiration," without direction from the RLM, to mask the wing from detection during attacks on Allied ships equipped with air-search radar. Reimar had first written about RCS in the article, ""Ala Volante Caza "Horten IX"" (Flying Wing Fighter Horten IX), published in the May 1950 issue of Revista Nacional de Aeronautica (National magazine of Aeronautics published in Argentina). Following the heightened interest in all-wing aircraft after the public unveiling of the USA's Northrop B-2 bomber on 22 November 1988, and fueled by Reimar's recent claims, some writers extrapolated from the similarity of the B-2 to the Ho 229 (both all-wing aircraft) to conclude that Reimar had designed the first stealth aircraft because he used an all-wing layout and purposefully reduced the Ho 229 jet wing's RCS. Examples of this writing are Stealth Bomber - Invisible Warplane (Motorbooks, 1989) by Bill Sweetman, and David Baker's article, "In Valleys of Shadow - The Black World of Stealth (Part One)." They apparently did not believe that Reimar shaped the Ho 229 solely for aerodynamic reasons, that the jet was simply one in a long line of all-wing Horten aircraft, and that there exists no physical or documentary evidence to support Horten's claims. His story is weak for several other reasons. Allied ships were equipped with air-search radar; however, these were low-priority targets for the Luftwaffe compared to the waves of heavy bombers that had pounded Germany day and night from the beginning of summer 1943. Germany needed vast numbers of interceptors capable of penetrating the screens of Allied fighters protecting the bombers, not long-range strike aircraft with low RCS. Oddly enough, neither Reimar nor Walter Horten mentioned to Allied intelligence specialists immediately after the war the RCS techniques that Reimar claimed in 1983 he applied to the Ho 229 during the war, a peculiar omission in light of Reimar's strong interest in resuming his work with an Allied aviation firm. Finally, if the Ho 229 was as speedy as Reimar estimated, why would the aircraft need to evade radar detection when it could outrun any Allied fighter? When the Mary Baker Engen Restoration Hangar at the Steven F. Udvar-Hazy Center opened on 15 March 2011, the H IX V3 outer wing panels were on public view in the new workshop. NASM collections care specialists moved the wing's center section to the restoration hangar in 2013. They moved both the wings and the center section into the Boeing Aviation Hangar in September 2017. Horten, Reimar, and Selinger, Peter F. Nurflugel: Die Geschichte der Horten-Flugzeuge 1933-1960. Graz, Germany: Herbert Weishaupt, 1983. Lee, Russell. Only the Wing: Reimar Horten's Epic Quest to Stabilize and Control the All-Wing Aircraft. Washington, D. C.: SI Scholarly Press, 2011. Myhra, David. The Horten Brothers and Their All-Wing Aircraft. Atglen, Penn. : Schiffer Military/Aviation History, 1998. ____. The Horten Ho 9/Ho 229 Technical History. Atglen, Penn. : Schiffer, 2002. ____. The Horten Ho 9/Ho 229 Retrospective. Atglen, Penn. : Schiffer, 2002. Shepelev, Andrei, and Ottens, Huib, Horten Ho 229 - Spirit of Thuringia. Hersham, England: Ian Allan, 2006. Horten H IX V3 curatorial file, Aeronautics Division, National Air and Space Museum. Reimar and Walter Horten Oral History Interviews [Myhra], National Air and Space Museum Archives. WW II; twin jet engines; delta shape; steel fuselage with wood coverage.